After the pomp and ceremony of Fridays Royal Wedding (and I was loving the marching and tradition for the day,) todays bride is completely apt. Not only do we have a classically elegant princess bride but we also have her knight in shining armour, in uniform no less. 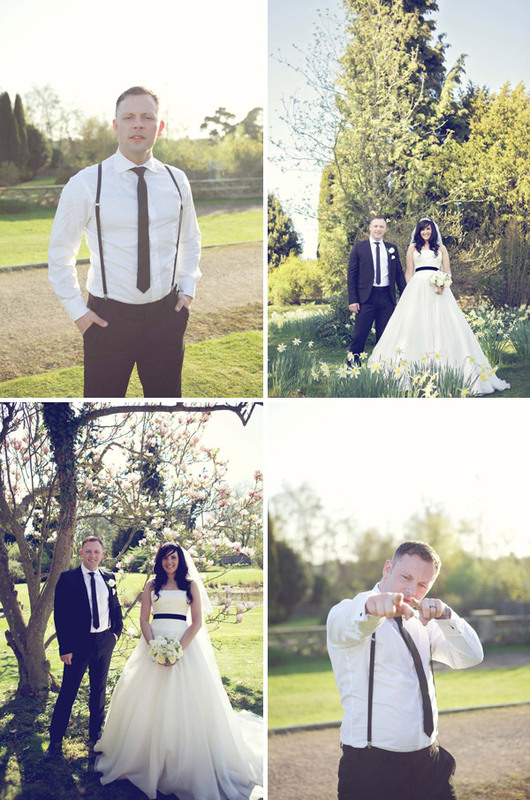 An exercise in restrained style and not letting a theme take over the day, Claire chose a white on white day, punctuated with traditional touches and dress-up fun with the perfect photographer to catch it all… the genius that is Lisa Devlin. 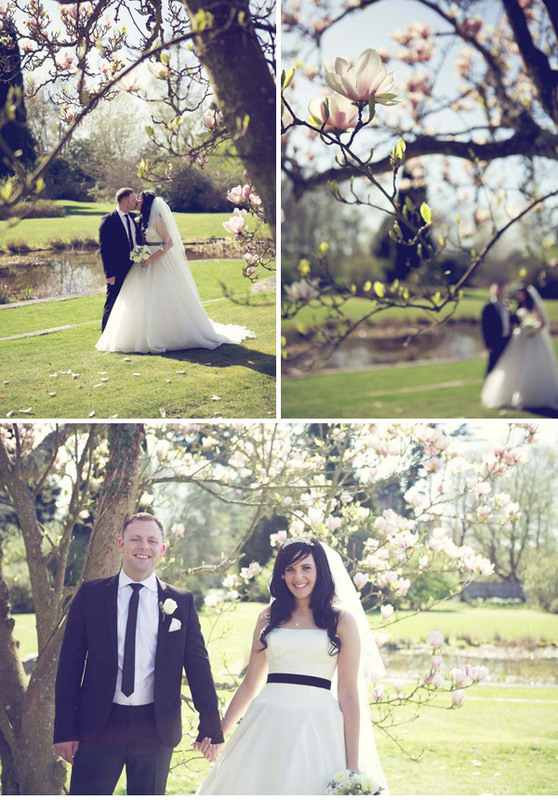 Claire and Steve were married at Buxted Park in East Sussex on the 8th April 2011. 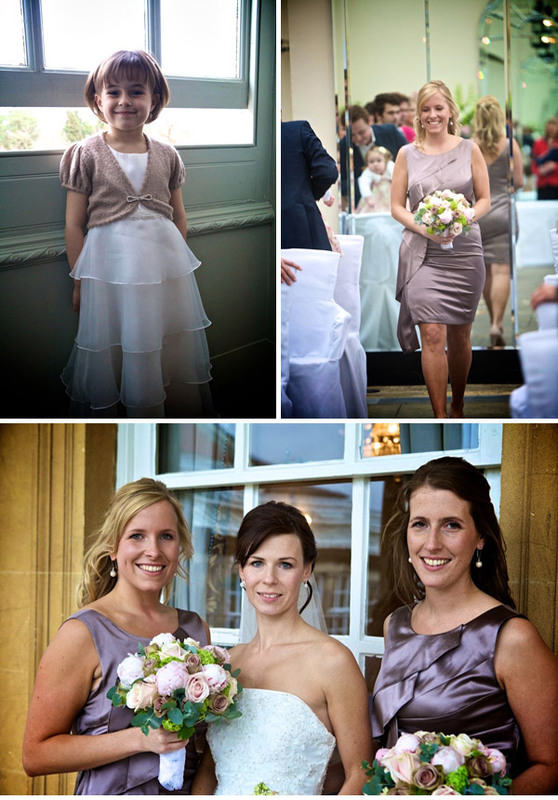 My dress was by Caroline Castigliano and I bought it from her boutique in Guildford. The dress is named “Beauty”. 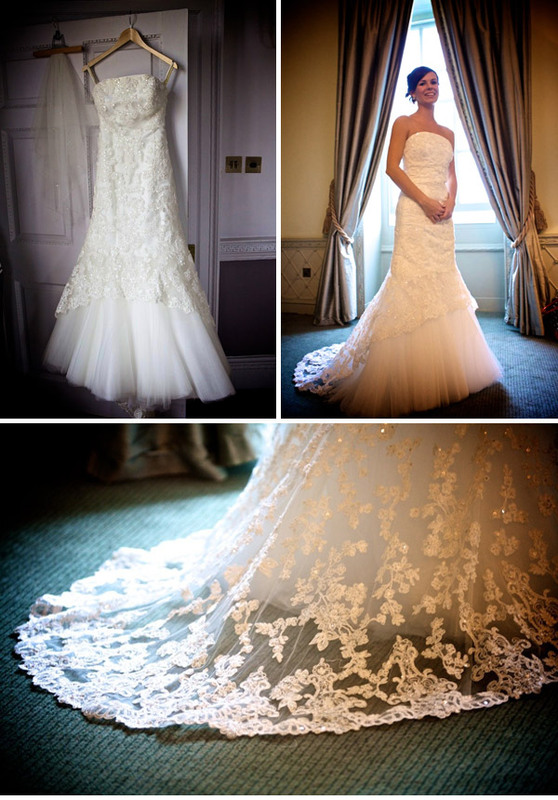 It was the first dress that I saw on the first page of the first wedding magazine I bought just after we got engaged. As soon as I saw it I thought it was just beautiful. So classic and elegant, and without any sequins or sparkles which is exactly what I wanted. When I tried it on, it looked absolutely gorgeous I had to have it, I did try on a few other dresses but none of them even came close! I also chose a black velvet sash and a Swarovski crystal butterfly brooch to wear on the back to add a tiny bit of sparkle. 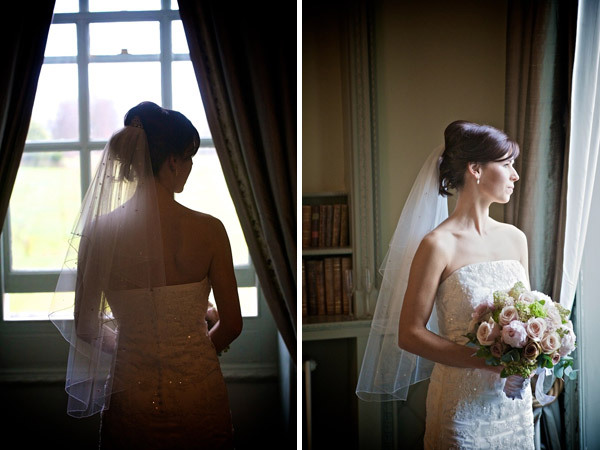 My veil and hair accessories were also from Caroline Castigliano in Guildford. The ladies there are so helpful, they helped me choose the right length veil and had a gorgeous selection of tiaras, jewellery and haircombs. I wanted to keep my whole outfit a secret from friends and family to surprise them on the day, I never went to my appointments with anyone until I collected my dress, so the ladies there were the only people I had to help me! But they always had time for me and I loved every visit. I chose a two tier cathedral length veil, which blended with the skirt on my dress and I chose a handmade Swarovski crystal tiara comb to compliment my crystal butterfly brooch. I wanted simple jewellery as I didn’t want to overpower my dress, so I chose a small pair of crystal studs with matching necklace. My sister has the matching bracelet which I bought her for her 18th birthday so I wore this as my something old and borrowed. Definately kitten heels! 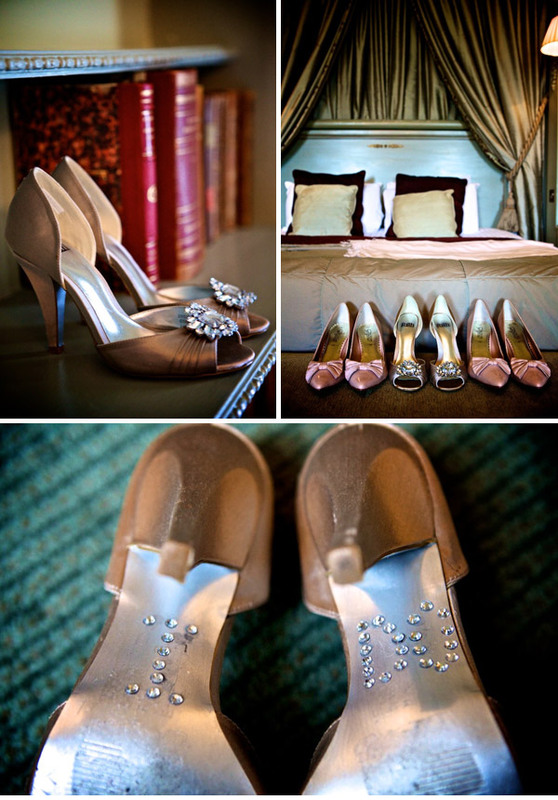 I chose ivory satin shoes with tiny scattered crystals by “Else”. I bought them from a small wedding shop close to where we live. I wanted lower heels as I’m quite tall, I didn’t want to be taller than Steve on the day and I wanted to be as comfortable as possible for as long as possible, so these were perfect. My hair was actually done by my sister Leigh, who is a hair stylist. We tried a variety of styles but I didn’t want to look too different and still wanted to feel comfortable, so we eventually opted for hair down. She set it in rollers and added some hairpieces to thicken it and add length. My make-up was by make-up artist Gemma Sutton. I wanted dark smokey eyes with lots of lashes to enhance my green eyes. Gemma is brilliant at what she does and made me look absolutely beautiful I didn’t want to take my make-up off I loved it so much! I was a bit lost when it came to choosing flowers, my only specific requests were that Freesias were included as these were my Mums favourite flowers and she passed away when I was 16, I also wanted to keep a spring time theme in the flowers, and that everything should be white! So we met up with Donal at Pollen Flowers in Brighton. 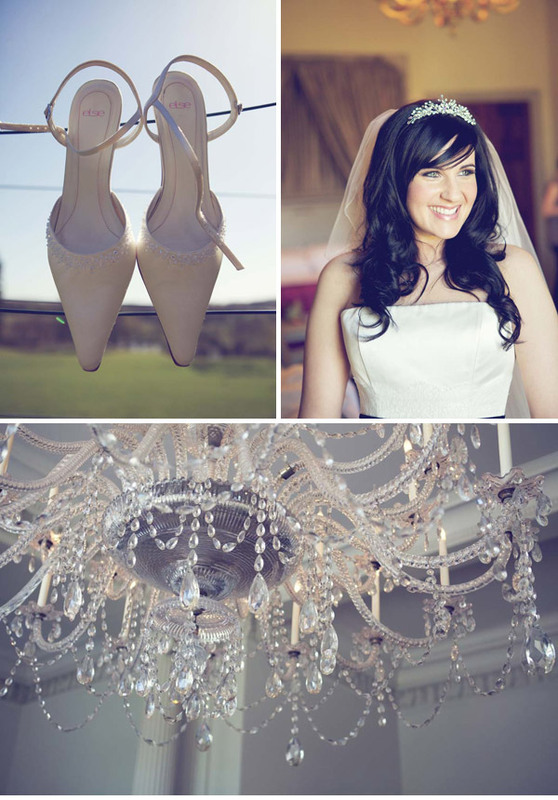 As soon as we met I realised we didn’t need to worry anymore, we discussed our colour scheme and the look we wanted to achieve and Donal drew up a plan for not only our flowers but for all our wedding decorations! He works on Buxted Park weddings a lot, so I completely trusted him to make everything look gorgeous, and he did! My bouquet was made up of white avalanche roses, freesias, ranunculas, stocks and herbs with smaller versions for my bridesmaids. My bouquet also had a silver heart shaped locket woven into the flowers containing a photo of me with my Mum. The buttonholes were white roses with herbs and our table centres were large silver candelabras with vintage glass crystals, with the base surrounded by tiny diamante vases filled with white avalanche roses, and sprinkled white rose petals and diamantes on the tables. Our best man wore a black Skinny suit from Topman with a black skinny tie, and our bridesmaids wore long black evening dresses which we found in TK Maxx. The girls also wore pearl jewellery from Accessorize and fire engine red lipstick to compliment Steve’s tunic! Other than that we kept everything black and white. I didn’t want to get caught up in finding exact shades of colours, and having everything matching exactly, and decided anything goes with black or white. 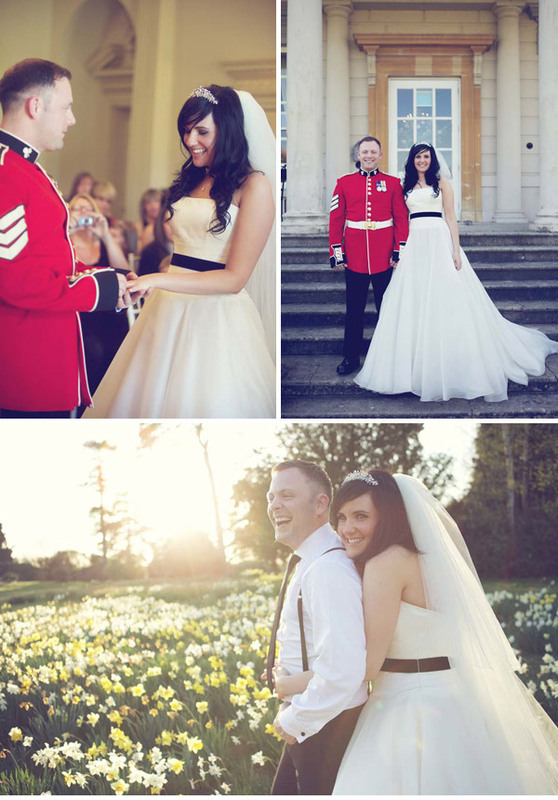 Steve is a soldier in the 1st Battalion Irish Guards, so he wore his ceremonial tunic and medals for our ceremony. I am so very proud of him, and he looked so smart waiting there for me. It was a warm day, and the uniform is not comfortable so soon after he changed into his black skinny suit, also from Topman. Our photographer was Lisa Devlin. We checked out her website first of all and absolutely love her style. 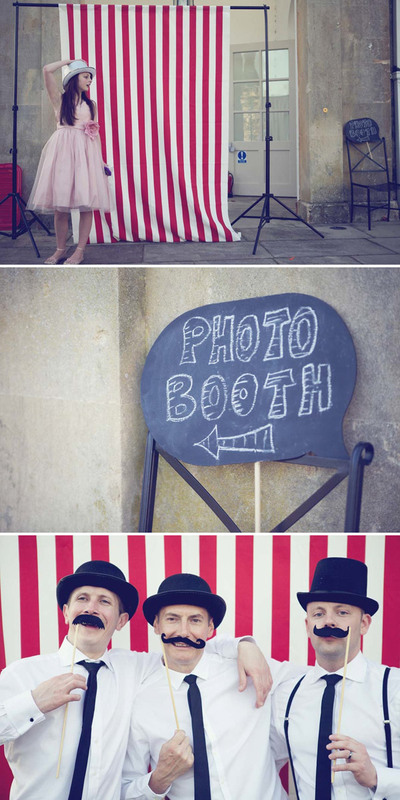 Her photos are quirky and really vintage looking, which is something that we wanted, as they’re different to most wedding photos you see. We also wanted a lot of natural and fun shots and didn’t want to pose for hours uncomfortably. 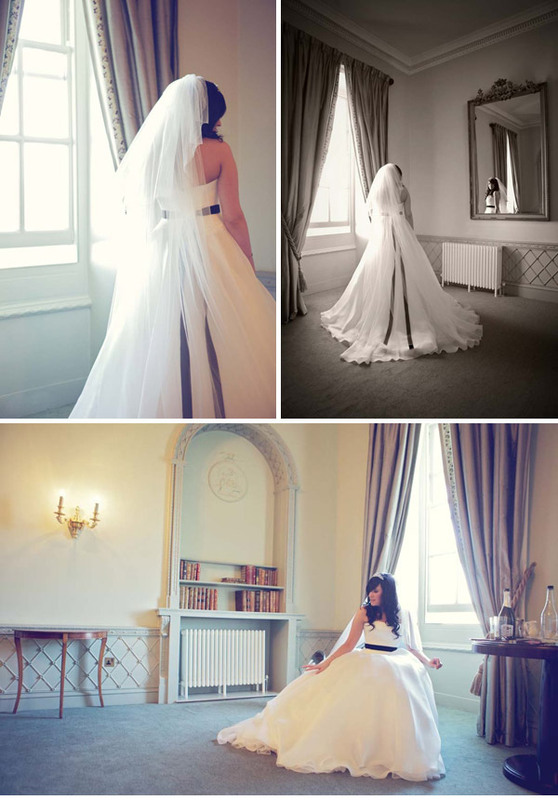 The photos on her website were just what we wanted so we met up, and straight away we knew we wanted Lisa. She was really easy to get on with, and we all had a laugh which was important to us if we were to spend most of our day with her. 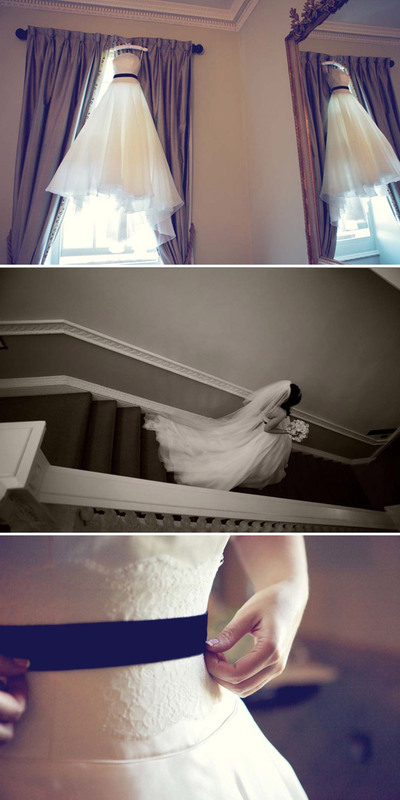 She made the day really fun, and was taking photos when we didn’t even realise so we got some gorgeous natural shots. 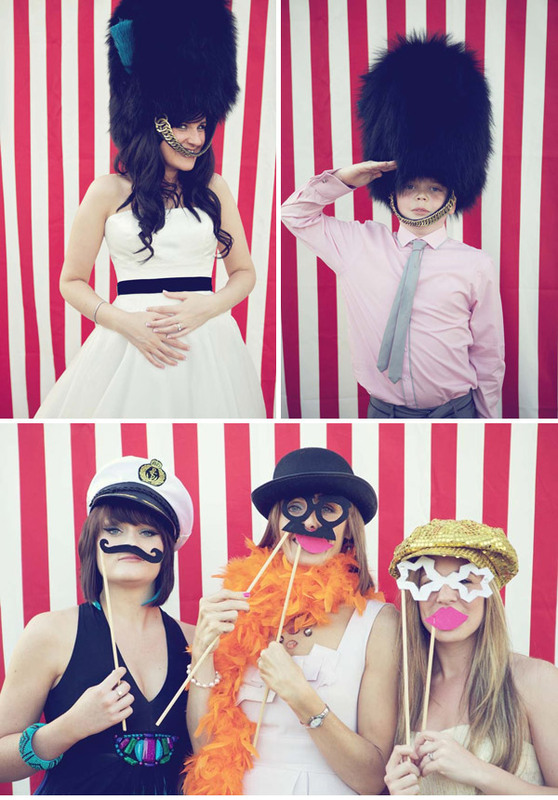 Her photo booth was also a fantastic idea and lots of fun! Our cake was made by Donna Asplin. I wanted a chocolate wedding cake, but with our reception being in the Orangery I was worried that if it was a warm day, the heat would melt our cake. We met Donna at a wedding fair at Buxted Park, and she explained that she could make any cake, one from her collection or she could design one especially for us, so we arranged a meeting with her. She was so helpful and had lots of pictures of her own cake designs as well as lots of cake magazines for inspiration. I explained the dilemma with the chocolate cake, and she suggested making the same design, but make the icing look like chocolate which we thought was brilliant. We chose a plain ivory design with icing made to look like draped fabric with sugar roses to compliment the roses in our flowers. We decided not to go for to usual fruit or sponge cake but had chocolate cake with a chocolate ganache filling on the bottom, lemon cake with a lemon butter cream filling in the middle and orange cake with an orange butter cream filling on the top. The icing/chocolate design looked so good, our venue actually thought it was a cake made of chocolate and kept it in a cool room until the evening! Our decorations were all designed by Donal at Pollen Flowers. 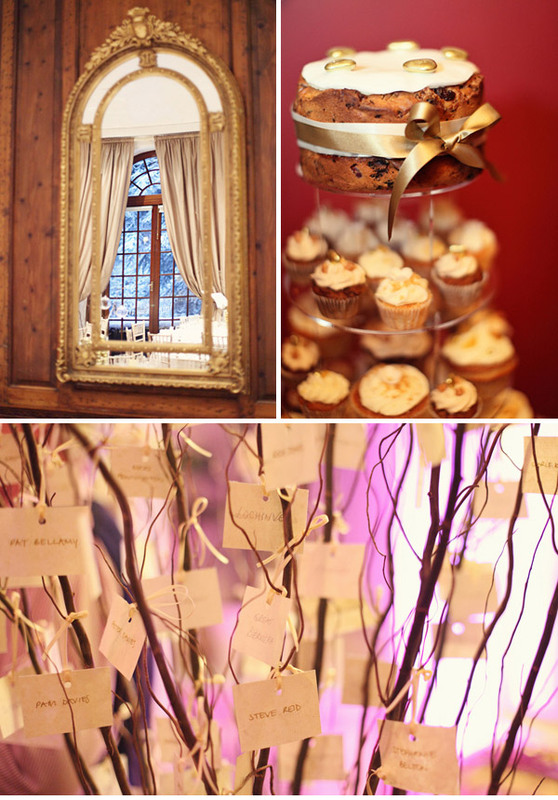 As well as making our tables look gorgeous, he also provided our white chiavari chairs, rose petal confetti in individual organza bags, white butterflies in the topiary trees and lanterns with candles inside along the corridor, amongst so many other lovely details. I wanted to mount our table plan on to a white vintage mirror instead of just plain board, so he even went out a few days before the wedding and bought a white vintage mirror from an antique shop so I could borrow it for the day! It all looked amazing. We both love our indie music so harps or string quartets and love songs were never going to be part of our wedding, but we did want some background music for our drinks reception. We are both busy with work and didn’t have time to arrange music on an ipod to play, so I had a look for some entertainment. I came across Kieran and Dom in a wedding magazine, they are an acoustic guitar duo, and checked out their website. They were exactly what we were looking for. They can play anything that you ask them to, and played a really good mix of old and new, everyone commented on how good they were. They also played through our ceremony, and helped me pick songs that would be suitable. The songs sounded brilliant and created the relaxed atmosphere we wanted. We then had a DJ in the evening for a good old party. Our first dance was to “You’re the Best Thing” by Style Council. We both love Paul Weller and the words in it are special to us. Its also quite a summery sounding song and went really well with our chilled out, spring garden party atmosphere. People told me there were things they didn’t like or agree with during the planning process, but I did them anyway! It’s your day, and you only do it once so have it exactly how you want it. We loved every second of our day. 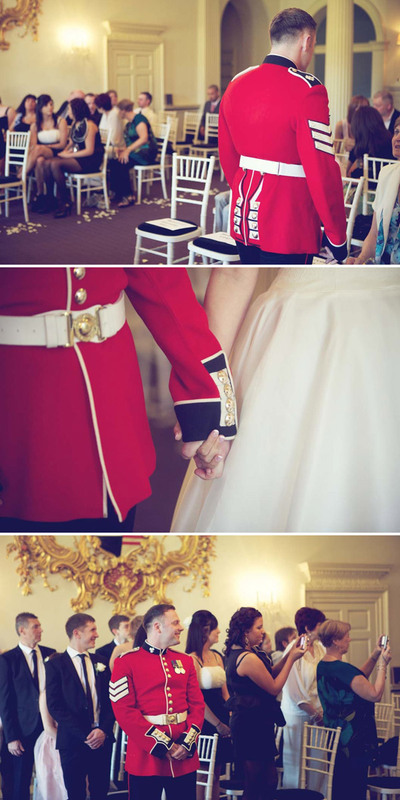 I love a white wedding and after Friday, that Red tunic is the perfect pop of uniformed colour to add the necessary pomp and ceremony to an otherwise relaxed day. 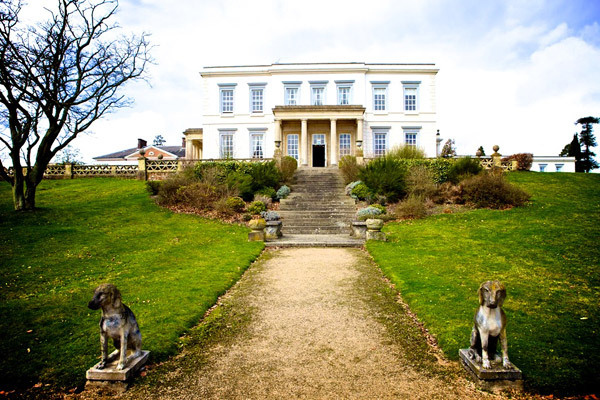 Our wedding was on the 30th March 2010 ( Tuesday- a bit weird) but it was two years to the day that we got engaged, at Buxted Park hotel in East Sussex. 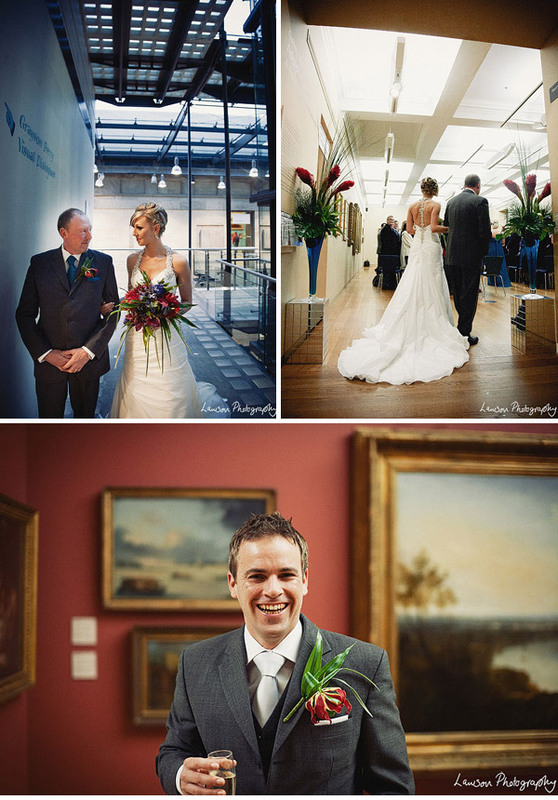 We (Nicola and Daniel) arranged it all within 6 months after falling in love with the venue. 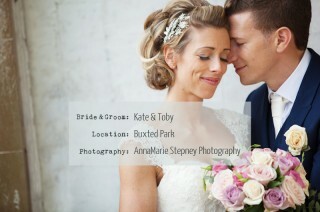 My Dress was from the Bridal Outlet in Oprington- and was from an American design House called Forever Yours. Being petite (5ft 3) and a size 8 I wanted something slim/elegant but still girly and cute. Many of the dresses wore me- rather than me wearing a dress so at first felt like a little girl putting on my mums dresses! I wanted to have limited accessories as my dress was heavily detailed. I had a short simple veil which I wore low from the back of my hair, fixed with a diamonte fan shape combe from Lucy in the Sky. I also chose a pair of drop diamonte earings from Lucy in the Sky. My shoes were my “something old” well I had worn them once to Daniels twins wedding last year, from Faith. They were high…as I said Im only 5.3 and used to wearing heels. In a vintage champagne satin. Peeptoe with a large diamonte on the front. I decided to personalise them by having “ I DO” in studded diamontes on the under sole part of the heel, as well as adding a seam of studs down the back. They were a real talking point and at one point was on a sofa with my feet up so everyone could take a photo! I decided to get a make up trial but honestly didn’t like it- not that it was a bad job or anything- just didn’t feel like me and Daniel was really unsure. So I went and hovered around the make up counters and got some expert advise and brought some quality products and did it myself. Estee Lauder Double wear foundation all the way! My hair I wanted up and to echo the elegant vintage look of my dress. 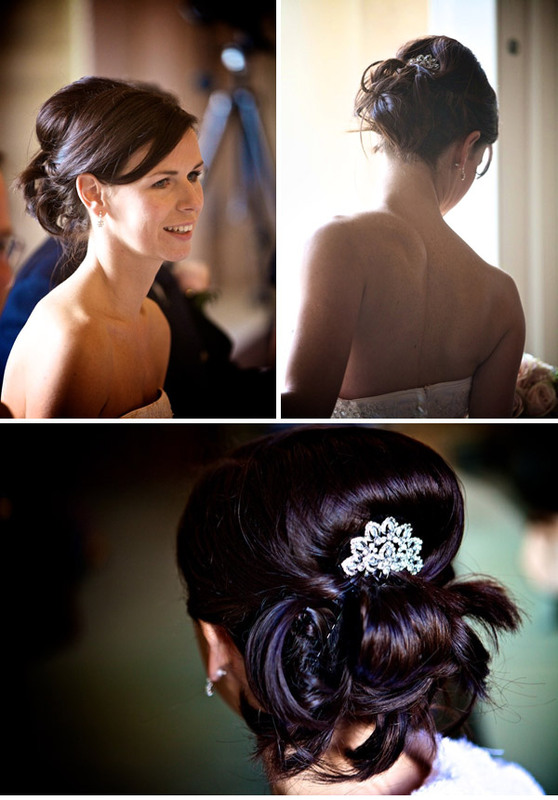 A family member’s gilfriend Nicole was coming to the wedding but is also a brilliant hairdresser who works at Daniel Galvin in London. She offered to do mine and the bridesmaids hair and was great. I was so pleased with how it turned out and was just what I had imagined. 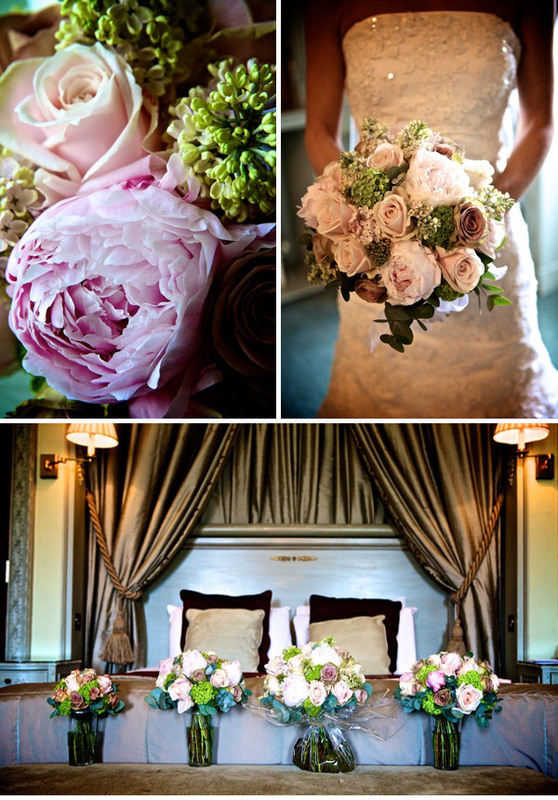 Unusual…but this Bride was also the florist! 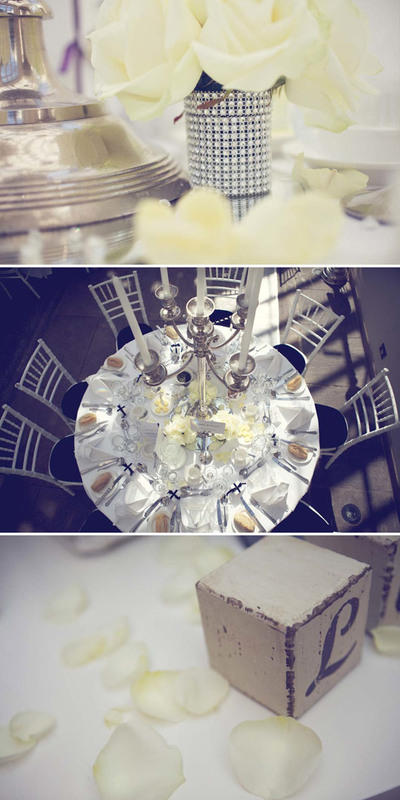 I have my own company Florian and have been doing weddings for around 8 years. So knew exactly what I wanted. I did have a problem that my favorite flower peonies were out of season and thought I would be out of luck. It so happens that that morning when I went to market (Covent Garden) I saw them…not small insignificant ones but beautiful full ones called Sarah Bernhardt. Perfect. 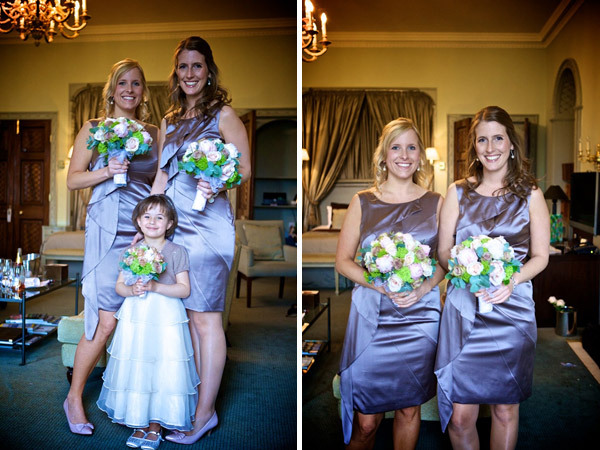 The girls wore satin dresses from Karen Millen in a mocha colour. They were cut on the bias and had a ruffled section down one side. 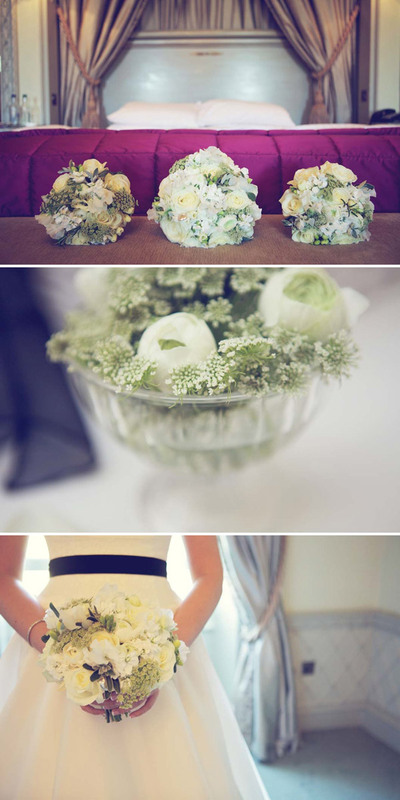 I really love this wedding and I think it’s a worthy contender for the title of Prettiest wedding. 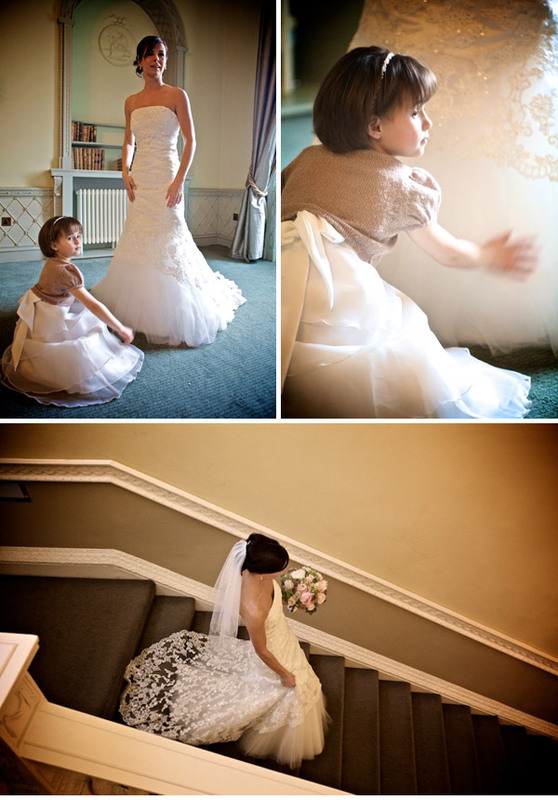 Such a timeless colour palette with a touch of vintage about it and a nothing short of perfect dress, all photographed beautifully by Lisa Devlin. 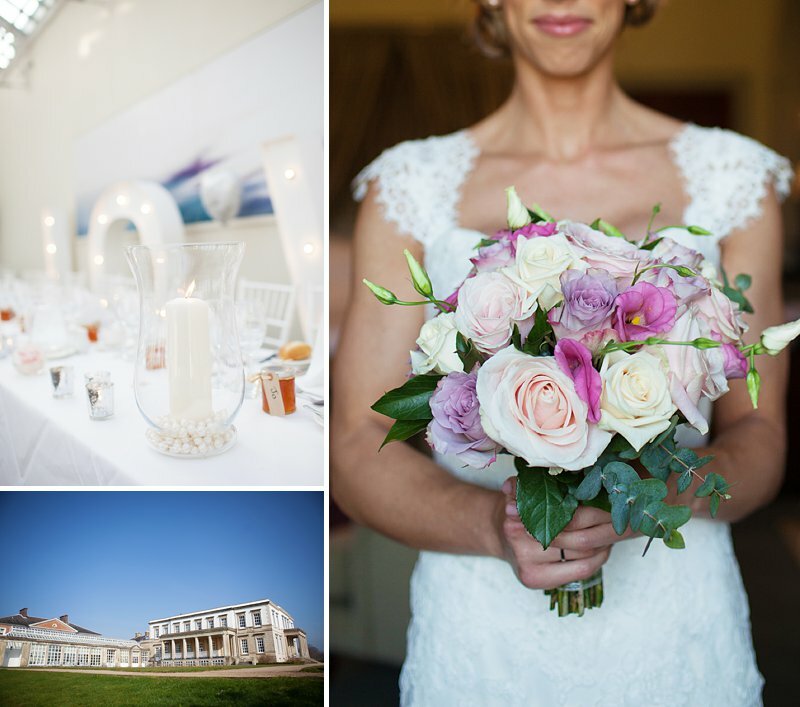 Pop back tomorrow for the rest of the beautiful flowers, gorgeous venue and a whole lot more pretty.